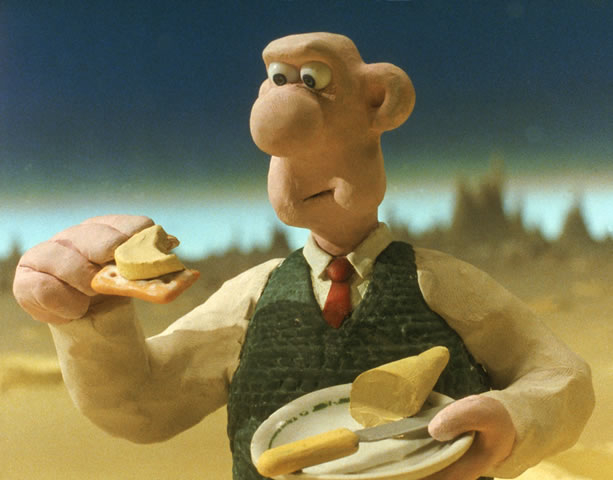 Are Wallace and Gromit stop-motion animation’s most famous cheese-lovers? 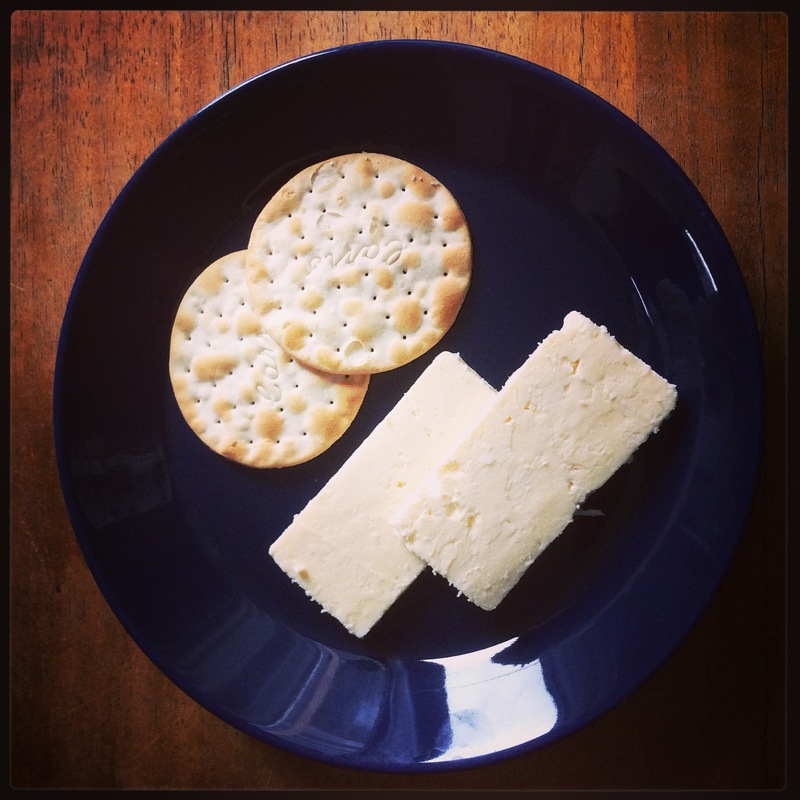 Undoubtedly – although I’d love to hear suggestions for other cheese lovers on film please. The plot of Wallace and Gromit’s first film, A Grand Day Out (1989) opens with Wallace trying to select a holiday destination while also needing to satisfy his urge for some cheese and crackers. But the cupboard is bare and it’s a Bank Holiday so no shops are open. What to do? Why build a rocket and set off for the moon of course, because as everyone knows, the moon is made out of cheese! Wallace and his loyal canine companion Gromit are keen inventors (Gromit likes to read books like Electronics for Dogs in his spare time) so in next to no time they’ve constructed a fantastic rocket to jet them off into space, and painted it a fetching shade of orange to boot. Wallace lights the fuse but at the last second realises he’s forgotten the crackers that will be required to accompany the lunar cheese they’ll soon be munching. Luckily he manages to fetch them before they blast off. So far so good. Once on the moon, they sample a large amount of lunar cheese, finding its unusual flavour hard to pin down. ‘it’s like no cheese I ever tasted’, says Wallace. After a series of adventures involving an oven that fantasises about skiiing, they return back to earth, laden with cheese from the moon. 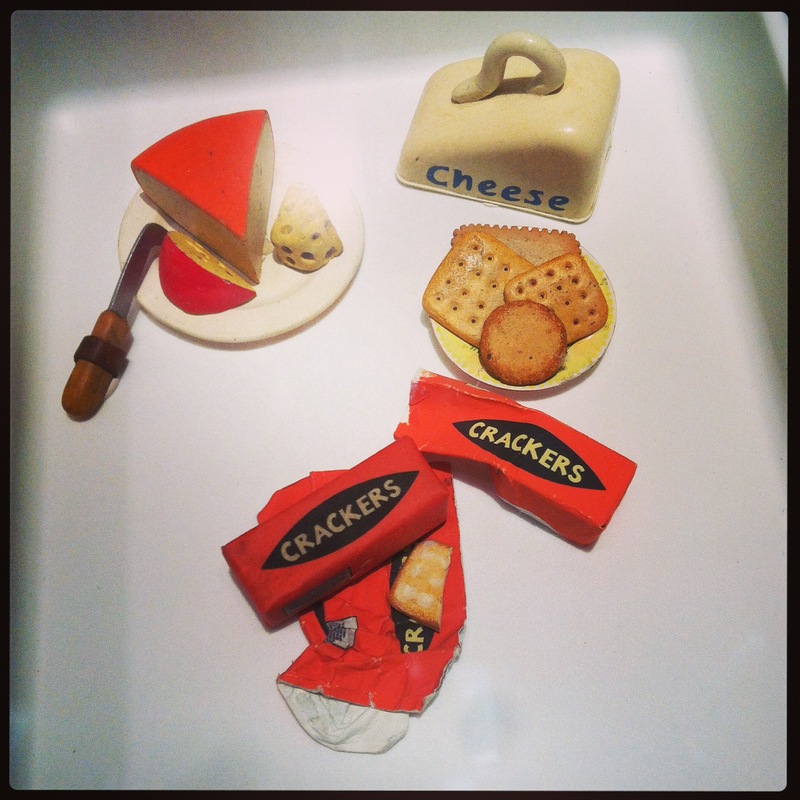 A large part of Wallace and Gromit’s charm comes from their old-fashioned (northern) British lifestyle and tastes. As well as their daily tea and cheese ritual, they are fond of tea and toast, and Wallace suggests that when in crisis it’s sensible to think of Lancashire Hotpot. In subsequent Wallace and Gromit films, The Wrong Trousers (1993), A Close Shave (1995), The Curse of the Were Rabbit (2005) and A Matter of Loaf and Death (2008) their culinary repertoire gets further widened although it generally stays firmly rooted in British tradition (the odd nip of French Bordeaux aside). Porridge, cornflakes, black pudding with bacon, buns and other baked goods (especially as Wallace and Gromit become bakers in A Matter of Loaf and Death) are all favourites. Wallace even gets a bit of health kick in The Curse of the Were Rabbit, first when Gromit puts him on a leafy diet, and even more so after Wallace’s ‘bit of harmless brain manipulation’ gives him the palate of a bunny rabbit. But it’s cheese that remains their staple food of choice. Wallace has paintings of cheese on the walls, a cheese identification chart above his bed and there are cheese (and film) puns galore, especially in The Curse of the Were Rabbit where the titles of famous books, films and plays are re-imagined in cheese terms: Waiting for Gouda, Fromage to Eternity, Brie Encounter and East of Edam to name but a few. You can’t help but think that a passion for cheese would also have to be a requirement if Wallace ever began online dating. In A Close Shave he realises that he and Wendolene can never be together after she tells him she detests cheese and is in fact allergic to it. ‘Not even Wensleydale?’, Wallace gulps. Wensleydale is one of Wallace’s favourite cheeses. It’s produced in North Yorkshire, although by the early 1990s cheese production in Wensleydale was under threat as its parent company wanted to close the creamery and move production to Lancashire. Happily a group of local people who’d worked at the creamery were able to buy the owners out and retain production in Hawes. The popularity of Wallace and Gromit gave Wensleydale a huge boost in sales and the inventor and his dog have even been honoured with their own Wensleydale range including not just cheese but also crackers and jars of ‘middle-aged spread’ chutney. I too am partial to a bit of Wensleydale and in homage to Wallace and Gromit on this rainy August Bank Holiday, enjoyed a nice cup of tea with Wensleydale and biscuits as an afternoon treat. Cracking! Food and eating feature prominently (how could they not?) in ‘Wallace and Gromit from the Drawing Board‘, a delightful exhibition currently running at M Shed in Bristol where Aardman Animation, the creators of Wallace and Gromit are based. On show are models, sets, drawings and storyboards from the Wallace and Gromit films tracing the journey of the characters from concept to screen. Pictured is the kitchen set and a close up of some of the prop food made for A Matter of Loaf and Death. It’s even possible to pose for a photo with the pair – say CHEESE!’. 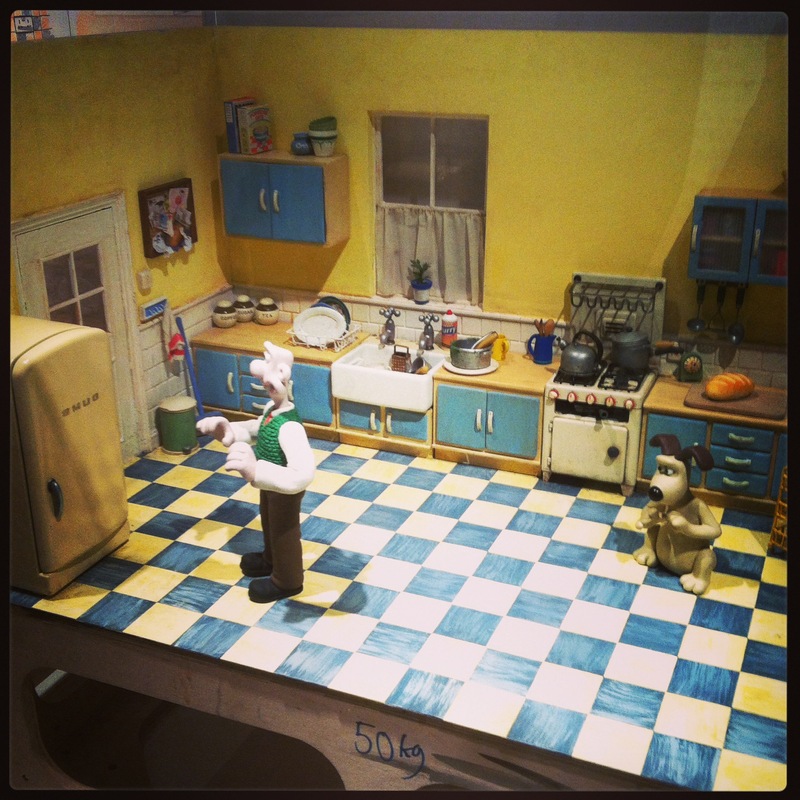 ‘Wallace and Gromit from the Drawing Board’ runs at M Shed in Bristol until 7 September.